Dr. Cohen has been in veterinary practice for over 20 year. 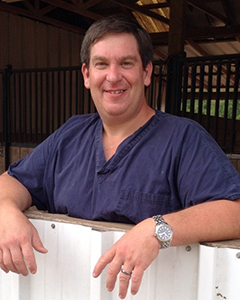 Dr. Jonathan Cohen is a 1993 graduate of Ross University School of Veterinary Medicine. As well he has been a farrier for over 24 years. Dr. Cohen specializes in equine hoof related issues and sports medicine. He has had a vast amount of experience with the equine athlete; taking care of Standardbred racehorses for several years, treating racing quarter horses as well as taking care of some of the top performance horses in multiple disciplines from barrel racing to endurance racing. Dr. Cohen's eye for picking out and deciphering lameness in horses is unequaled and along with an ability to find practical cost effective solutions places him in demand. Having been classically in the art of farriery as an apprentice over 20 years ago; Dr Cohen has maintained an active role in the farrier industry. Dr. Cohen has lucky enough to gain experience from some of the best farriers in the world; including greats like Burney Chapman, Ric Redden, Bob Peacock, Jim Keith, etc. Dr. Cohen is available for consultation on hoof related issues and can provide solutions that fit your specific situation and the skill level of your farrier. He is able to come up shoeing solutions for your horse in concert with your farrier or by directly working on your horse and coming up with a long term plan.